At the heart of the innovative kit is the 1/4 steel crossmember that bolts to the chassis in place of the factory strut rod mounts, eliminating the factory strut rods, and adding adjustable forward control arm mounts. 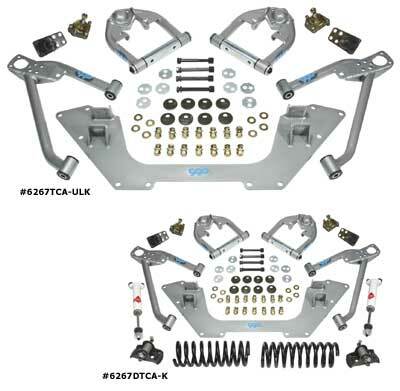 This kit adds stability, alignability, improved steering response and over 2 of ground clearance for your early Nova. By eliminating the binding action caused by the factory strut rods you are able to maintain proper wheel alignment without the use of a Lock Out Plate and gain a free working up and down motion in the lower control arm. The results are better ride quality and positive road feedback. The Mini Sub-Frame accommodates both factory and aftermarket sway bars, power and manual steering and even allows the use of aftermarket rack & pinion systems. The installation is incredibly simple, and is usually completed in about 4 hours. The one-piece crossmember ties both frame rails together by bolting in the original holes where the factory strut rod mounts were located, providing additional strength. The design adds only 2lbs to the car after removing the heavy factory strut rods and bulky strut rod mounts. There is no cutting welding or drilling required. The rear of the lower control arm mounts in the factory location and the original type of camber adjustments are used. The front of the lower control mounts to the new crossmember and adds a forward caster adjustment thats the same type as the rear camber adjustment. The entire assembly occupies less space than the original and improves the turning radius, and adds tire clearance. The upper control arms are preassembled on new billet chromolly 4130 cross shafts and pivot sleeves. CPP is leading the industry with billet cross shaft and pivot sleeves that captures both sides of the bushing, unlike the originals that were only retained on the 1 side of the bushing under the head of the bolt. As a result of the fully contained bushings, the arms are even stronger. Forces that would make other arms flex and twist are transferred through the bushings and easily handled by billet cross shaft. CPP created a safety feature with an interlocking shaft and sleeve design that prevents the bolts from working loose even under severe stress created by hard corning. The arms are made from 1-1/4 120 wall DOM tubing and have beefy 1-1/2 188 wall pivot barrels. The continuous round cross section adds torsional rigidity. The beefy 1-1/2 .188 wall pivot barrels ensure the pivots will stay true and operate with maximum efficiency. The, CPP exclusive pivot bushings are a patented self lubricating plastic that will not squeak, and has a working temperature of over 400 degrees. These plastic bushings refuse to break during impact testing and can absorb high shocks loads that would otherwise be transferred thru the chassis. The deluxe kit includes new 1-/2 to 2 drop coils springs. CNC wound coils are powder coated gloss black and are backed with a lifetime warranty. Note: If these coils are used with 2 drop spindles the car may become too low.